About 38 percent of the contiguous United States suffered moderate to extreme drought conditions at the end of July, a fact that has drawn researchers to the topic. A team at Southern Illinois University Carbondale is carefully analyzing drought trends to understand predictions and discover what can be done to decrease the impact of these damaging events. Three geography students led by Trent Ford, assistant professor in the geography degree program, are hard at work collecting data on recent droughts and the predictions leading up to them. The study specifically examines the effectiveness of the U.S. drought monitor and its usefulness to the common person. Makenzee Loft, senior from Roscoe, Illinois, started doing research with Ford when she was just a freshman. Now, she is carefully analyzing data to determine the effectiveness of the national supplier of drought information. The team is objectively examining the drought monitor to check for accuracy and detailing where it might be off. “Right now, we are going through the data and making maps to show where it is over-predicting or where it is under-predicting the various intensities of droughts,” Loft said. To do this, they are looking at data from 2000-2017 and mapping how accurately drought is identified in each climate division compared to the actual conditions. Angelina Arcuri, junior from Carpentersville, Illinois, is working with the data from a slightly different angle. Looking at reports people have submitted online to the Drought Mitigation Center shows what drought events have appeared near them, Arcuri explained. We will compare that data to the drought monitor to analyze the accuracy of the predictions. While Loft and Arcuri are working under a grant Ford recently received, Connie Kaniewski, a senior from Gurnee, Illinois, is using her REACH grant from SIU to join the team with a unique perspective. Kaniewski is using the same soil moisture data the whole team has been gathering, but she is also looking at distributions of droughts in the past, how fast they intensified and how rapid the onsite the drought was. Once this distribution is determined, Kaniewski will work towards defining flash drought and examining the meteorological impact of it. “The main goal in all of this is to be able to predict flash drought a little bit better and have a better understanding of the meteorological effects that make flash droughts different than more slowly developing ones,” Connie said. Flash droughts are an important topic, as they often have a more intense impact and can severely damage homes and livelihoods. The project hopes to bring valuable insight into the drought conditions of the country, but it also is providing important experience for the student researchers. 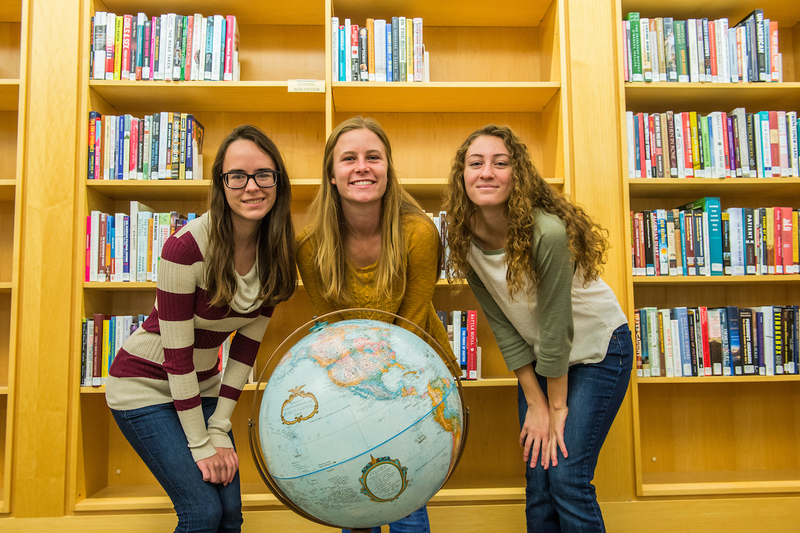 All three of the students are looking towards graduate programs in the future, and feel this research has set them up for success. Additionally, Arcuri and Loft are both being trained in MATLAB technology, which is a form of scientific coding that will prepare them for more research opportunities in the future. Ford received a grant in 2017 from the National Oceanic and Atmospheric Administration’s (NOAA) Modeling, Analysis Predictions and Projections (MAPP) program, in partnership with the National Integrated Drought Information System (NIDIS) program, to leverage existing observations with standard measures. That funding supports the project until 2020.